HootSuite, the multi-social network manager has released a simple, yet very useful addition to their suite of tools. 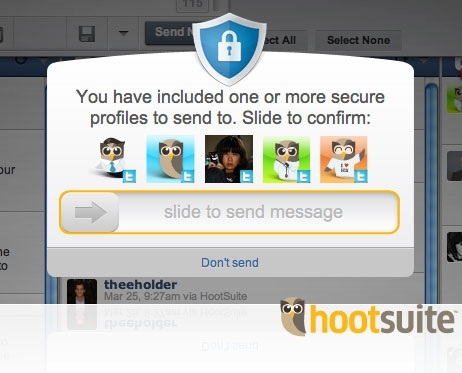 Dubbed HootSuite Secure Profiles, it allows account owners to require a confirmation before an update is published to social profiles. So, if a company profile (or several) is set this way, the user must use a slider (pictured below) as a confirmation before sending the message. It's a great idea – but sometimes what might seem like a good idea at the time, isn't. Just ask @ChryslerAutos. The rub (and there is one, of course) is that Secure Profiles is only available to HootSuite Enterprise members -- so you have to pay. A lot. Enterprise plans start at a whopping $1,499 per month. Otherwise, just be sure to educate your staff on acceptable social practices. And hire smart people. It's unfortunate that HootSuite isn't providing this tool for free. Wouldn't everyone be better off -- wouldn't the social Web be better off – with something like this available to everyone? I suspect a rival will soon have this feature available to all, for free, which could actually cause many users to switch their alliances – especially small business operators.